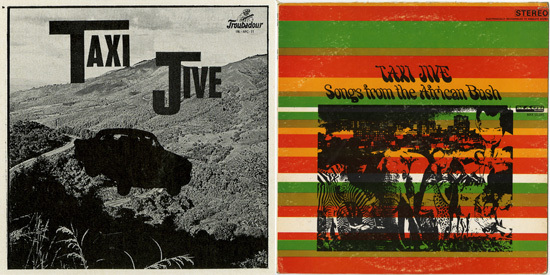 When Matt posted Taxi Jive - Songs from the African Bush here at Electric Jive in 2010 it generated a robust discussion around the dating of the record. Estimates ranged between 1965 and 1968 as comments referenced details regarding graphic design histories and various matrix numbers. After much deliberation it became apparent that the album had probably come out in 1967. Issued in the United States on the MACE label, the album featured a cross-section of mostly sax jives. And of course the US pressing was a reissue of a South African compilation of 78 rpm recordings on the Troubadour label (TRL-AFC 11). Matt in his post pointed out the contradiction in packaging an urban-generated sound with rural, stereotyped images of the African Bush for Western audiences. But perhaps, to be fair, the original Troubadour cover showing a silhouetted car floating over what I am guessing could be the Valley of a Thousand Hills in rural KwaZulu-Natal, was guilty of a similar kind of urban/rural fudging. Perhaps more central to that compilations title, was the idea of mode-of-transport as a central feature of most South Africans everyday lived experience. The vehicle, and the time spent in them traveling the great distances from home place (mostly in distant townships) to work place (in the cities), became an icon of both mobility and control. 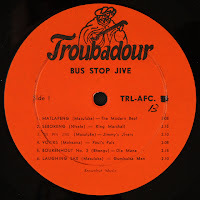 Similarly Bus Stop Jive (TRL-AFC 13), the Troubadour album featured today, continues this theme showing a large group of South Africans queuing to catch the bus. 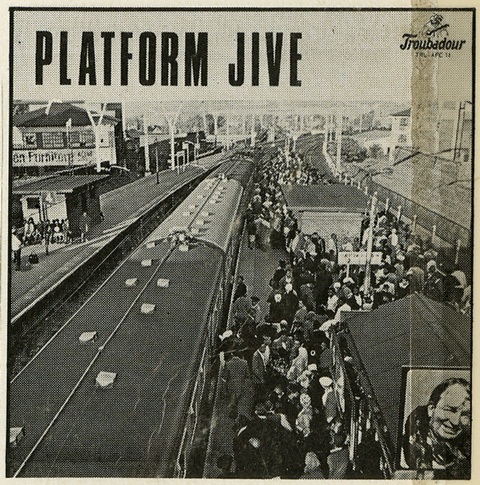 The very next LP in the Troubadour series, Platform Jive (TRL-AFC 14), completes the transportation trifecta with a focus on the train. Bus Stop Jive, like Taxi Jive, also features a range of urban sax jives issued on Troubadour's various imprints like the Soweto and Hit labels, including material by Jimmy Masuluke (The Modern Beat, Jimmy's Jivers, Gumbulza Men), Joseph Ntsele (King Marshall), Paul Mokoena (Paul's Pals, Prince Paul), Samuel Bhengu (Die Mane, Sammy Boy), amongst others. The two tracks by Die Mane are particularly curious and unique in that, to my ear, they feature what sounds like an mbira or thumb piano accompanying the sax and guitar. Send us your thoughts on the identity of the instrument. Paul Mokoena's Voviks was first issued as a 78 rpm on the Soweto label (ETO 9) and from that matrix number we can extrapolate that it was recorded in 1967. 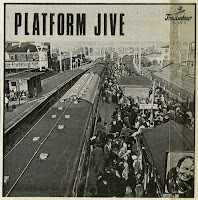 It is my estimate that this record, like Taxi Jive, probably came out that same year. According to Rob Allingham, by 1968 Troubadour had been swallowed up by Gallo. 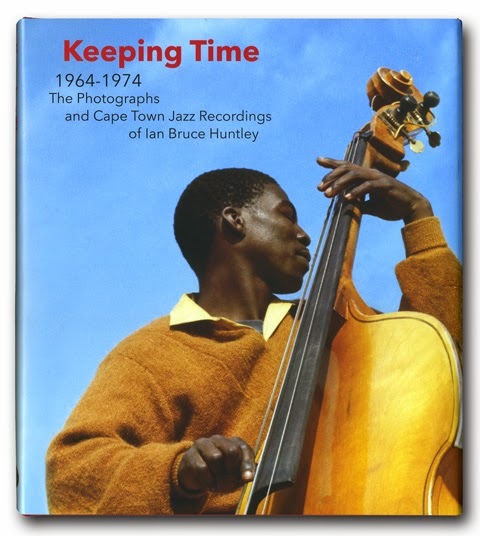 It is likely that these compilations probably capture some of the last output by this legendary Johannesburg-based company. Loving this album already ... thank you Siemon! And to engage with your query the instrument on the tracks by Die Mane sounds more like a "struck" instrument than a "thumbed" instrument to my ear but curiously the shallow shuddering echo of both the xylophone /mirimba and the thumb piano/ mbira can sound quite similar at times..... just my take for what its worth but am sure there are better ears out there! Very good compilation and I love the covers of this series. As a collector (even if it's only on mp3 that I'm collecting those LP), I hope to hear the third volume one day. 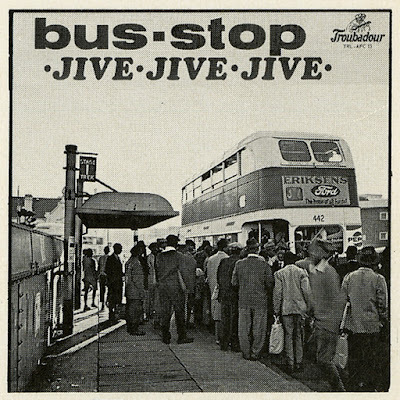 For now, thank you very much for this catchy "Bus Stop Jive". Please re-up. The link is deleted. Thanks.